Today, I have either a treat or a punishment for readers. It all depends on the point of view. I had called a company, One24, out for having characteristics of being a scam and pyramid scheme (the FTC’s guidelines were critical in making that call). It has recently come to my attention that One24 has responded to my One24 Scam article in one of their recent podcasts. The result is an extremely long article combating the misinformation that they spread over their marketing channel. If you like soap operas that have a high potential to turn into public lawsuits, I invite you to grab a cold drink (or 3) and enjoy the show. If you like quick articles about learning how to save money as I typically write let me direct you here. I realize this article is targeted to a small minority of Lazy Man and Money readers. However, because it is possible to save that minority thousands of dollars, I feel it is one of the more articles I’ve written. If you aren’t part of the minority, it might be best to just move on. You’ve been warned. The One24 Podcast title “The Scam” can be downloaded here. I recommend you keep my article open for reference. Before I go any further, I should mention that the company doesn’t mention me or my article by name, but it’s clear that they are address my article. They cover nearly every point point from beginning to end. I guess their lawyers realized that One24’s threat to sue me for defamation had no legal ground. It seems this is their plan B. I think I irk them because I rank at the top of Google searches for “One24.” It makes me a prime target for the company. Finally, I want to thank the people reading and comment on such articles. If it weren’t for one astute commenter, I would have missed the podcast and not been able to respond to it. Perhaps One24’s plan was to address their PCs (product distributors) directly and not give me the chance for a rebuttal. To help make this long article go a little easier on you, I’ve divided it into sections. The format of this podcast alone should raise red flags about the company. As one commenter, CGC, put it, it is presented as “a scripted ‘interview’, infomercial.” It is a podcast called “Inside One24” which is “exclusively produced” for One24 distributors. In the greeting of President Joe Perry, Phillip Gerogeson asks, “Have you run out of places to pinch yourself as to where this company has taken you in the last few months?” The answer from Joe Perry is, “It’s been an incredible ride.” This is the kind of scripted commentary from the company’s PR person to the company’s president. It must be pretty easy to nail points in an scripted marketing piece directed to distributors of the company. Let’s hope that those involved in One24 are smart enough to see this marketing for the scam that it is. Before getting to the slanderous use of “misrepresented”, I would like to dispute that my article isn’t making a dent. First, the company doesn’t have information on every PC to know if it is making a dent or a landslide. They aren’t at every showing of the product and/or plan. This is clearly a piece of marketing. They have to say it isn’t making a dent, because to say otherwise would cause panic. Secondly, this appears to be a lie. If it wasn’t impacting PCs they wouldn’t have threatened me with a law suit. More importantly if it wasn’t impacting PCs, they wouldn’t have to create a podcast directed towards PCs on the topic. As they said, they “lined-up the top gun to handle this, and to meet this information head on, and that’s our president, Joe Perry.” Clearly getting the president to address the concerns is a sign that this is an important issue. In fact, Joe Perry hasn’t been involved in any of the previous podcasts according his introduction in this podcast. Actions speak louder than words here. Finally, there is nothing “misrepresented” in my article. If there is, the company is welcome to enter in the debate in my comments just like many of their PCs have. Those PCs have tried and all have failed, just like the company would. Getting back to why they don’t have the guts to mention me by name – perhaps it’s because they know that I’d be the one able to sue them for defamation for claiming that I misrepresented others. Since the company is clearly targeting me and my article, I feel I should respond. I have to ask here is what is their definition of “growth” companies. I love growth companies. In fact, I invest a lot of my money in growth companies. I don’t know anyone that was against Groupon as a growth company, do you? This is a red herring fallacy. Secondly, the podcast makes a point that the reason that I target them is because they are my competition. What competition is that? I’m not involved in any MLM companies. I do not make or sell or any products similar to One24. Finally, One24 tries to spin this as a sign of success. They should step off their high horse. I got two emails in a couple of days because their distributors wanted to recruit me due to my connection of writing about MonaVie and Nerium. 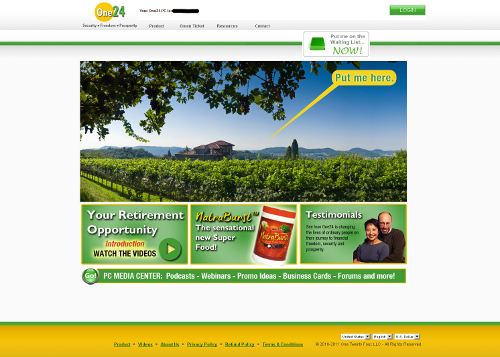 I didn’t write about One24 due to their “success”, I wrote about them because One24 distributors (PCs) claimed the business was a path to retirement. As a personal finance blogger that caught my eye. It’s kind of humorous that a company like One24 judges its level of success by what I write. Perhaps other MLM companies should offer to pay me to write about their scams, right? Since this podcast is in the business of pointing out “misinformation”, let’s focus on the above. NatraBurst does not contain more than 6 servings of fruits and vegetables. As I pointed out in my original article, this is a lie. MonaVie has used this same lie to claim that drinking 4 ounces of their juice is the same as eating 13 fruits. It turns out that many government agencies got together to quantify servings of fruits/vegetables. The guidelines are very clear. Unfortunately for MonaVie, which is 100% fruit juice, 4 Ounces of MonaVie is 1 Serving of Fruit. It’s worth noting that One24 is not 100% fruit juice (or anything close from its ingredients) and as a liquid can not claim to contain servings of fruit. I explained the difference in my original One24 article. One24 is misleading people into thinking that an ORAC score is the same as eating fruits/vegetables, which this completely false and extremely misleading. Furthermore the company takes the extra step of saying that USDA has recommended an amount of antioxidant protection. I’ll say there’s a possibility that I’m wrong here, but I really don’t think that the USDA has put out RDA of “antioxidant protection.” Readers, if I’m wrong please correct me and cite a source from the USDA’s official website. Still doubt that this podcast is about me? Phillip Georgeson then says, “You and I [company president Joe Perry] got together and it was predominant your idea to do this and I think it was a great one [pat on the back].” If there were any doubts this was staged that should be dispelled. It’s interesting that Georgeson says to forget why they are doing it, when they’ve previously put out misinformation on the topic. It’s great that they are going to address things head-on, because you can see the parallels with my one24 article. The podcast is intended to help distributors market the product. I take some offense by the use of that “only” there. It paints a very “black and white” picture where there are many shades of grey. It’s possible that there are some retail sales. As the podcast admits later on the real profits come from the recruiting aspect. So it would seem that my article is dead on with the company’s focus. In the article, I very specifically quote an email that I received. It said, “The concept is [recruit] one member a month for 24 months (One24), then retire.” I am happy to divulge this email in a court of law. One24 just needs to bring the lawsuit. In addition, Mr. Perry, gives us a lot to address here. There is nothing magical about a 24-month period. Some “neat things can happen” if you start with a penny and double that investment everyday over a 30 day period… you’d have around 10 million dollars by my calculations. This doesn’t mean that it is realistic. It doesn’t mean that one can do it consistently. It’s great that Mr. Perry and One24 “are really hoping” that PCs can cinch up their future. I’m really hoping you can double that penny’s investment everyday. Point is, it’s extraordinarily unlikely to happen. Mr. Perry and One24 requires you to buy their product to play that game. I’ll let you play the double a penny game for free. Note the space devoted to NatraBurst vs. "the Opportunity"
Note that the marketing message on that page (and thousands like it) is centered around retirement and financial security. Perhaps the statement about retirement is being stretched because your marketing people are stretching. This is done to recruit more people to sell your product and make larger profits. It’s worth noting that there’s almost no focus on the product here, but I’ll have more on that later). “Any time something like this company as successful as it is pops up the word ‘pyramid scheme’ comes up. It’s obvious to you and I but let’s go over that. How do you respond to the pyramid scheme because if you were to … calculate out the natural progression of enrolling 24 people over one year that eventually you’d run out of people in the whole planet? We actually saw that and… you and I laughed about it but explain why it is so ridiculous. Before we get to Joe’s response, let’s reflect for a minute on the question. Clearly companies are successful without the word “pyramid scheme” popping up. Here are a few examples, Facebook, Amazon, Ebay, Starbucks, and Google. I don’t see anyone calling them pyramid schemes. The other part of this question that is worth noting is that it is leading the answer, “It is obvious to you and I”, “laughed about it” and “why it is so ridiculous.” What is humorous about this is that in the recap of the interview at 24:20, Phillip Georgeson says, “… we would blow through the population of the world over time. You know on paper that is probably is true.” It is not just “probably true”, it has been mathematically proven to be true. You can see a depiction of it on Wikipedia’s article of pyramid schemes. Clearly this argument “that is probably true” (according to Phillip Georgeson) is not “so ridiculous” or worth “laughing” about it. “In 1976, Mark [Hughes] began selling Slender Now diet products for Seyforth Laboratories, a multilevel marketer, becoming one of its top 100 earners. After Seyforth collapsed in 1979, he sold exercise equipment and weight-control products for Golden Youth, another direct-sales outfit. While the article is about Mark Hughes, who is not to be confused with Mark Seyforth, it does point out how well Slender Now really did. It may have went to a 100 million dollars in 3 years, but by 1979 it “collapsed.” You know what else “collapses”? Pyramid Schemes. Take a read of Wikipedia’s Pyramid Scheme article and look for the number of occurances of “collapse.” Slender Now was an MLM company that started out really well but ended up collapsing like a pyramid scheme. That doesn’t like the shining example you want to give when trying to convince your distributors (PCs) that they are not involved in a pyramid scheme. In 1979 when Slender Now collapsed I think that CPA had the opportunity to give the king of “I told you so”s to his wife. It’s odd that Mr. Joe Perry claims that MLM saturation has never happened. If that were the case, he’d still be selling Slender Now and it would still be a growing company, right? This story of this one successful person is another example of marketing. They aren’t telling you about all the people who lost money when it collapsed. It is like telling the story of the one person who retired with One24 and ignoring the thousands of people who lost hundreds or more buying the overpriced product. The most important thing here is that he never addresses the logic of the CPA’s point… or the point about the unsustainability of pyramid schemes and MLMs in general. He just tells an isolated success story and glosses over the fact that Slender Now “collapsed” (according to the L.A. Times). It seems to me that the CPA was proven correct. Of course we wouldn’t expect One24 and their marketing people in their marketing Podcast to admit such a thing. So Mr. Perry claims it’s never happened which seems to be a lie using his own Slender Now example. In a span of 15 seconds he claimed following, it “can’t happen”, “never happened”, “won’t happen” and “not going to happen.” That’s extraordinary considering the example of “it happening” he just cited with Slender Now. Finally, I should bring back a point from my original article… the FTC says that “Not all multilevel marketing plans are legitimate. Some are pyramid schemes”. This is where the pyramid scheme nature comes into play. Remember that the FTC exists to help consumers and thwart scams. I give Phillip Georgeson credit for not glossing over the 50% discount of the product on Ebay. The first and most important thing you’ll notice is that the “auction sites”… Ebay… with the cheaper productis never addressed. The claim is made that Joe Perry and Mark Seyforth were going to address the health professional marketplace, but as best I can tell, they’ve always done MLM (Joe Perry says he has 30 years of experience later in the podcast). So we are to believe that they weren’t going to go with MLM with NatraBurst, but it turns out that they had this idea for an MLM company, after 30 years in the industry, and decided to switch the product’s distribution method. It seems the focus is on the big photo with rotating pictures of various vacation and retirement destinations. Under that picture is the words, “Your Retirement Opportunity.” To the right of that is the one part of the page devoted to the product. To the right of that is another box of testimonials about “financial freedom, security, prosperity.” If you were to divide the above page up into 9 boxes like a tic-tac-toe board, you’d find that about 1/9th of the space is devoted to the product and 8/9s is devoted to “the opportunity.” Sorry to cover this twice in the same long article, but I think it was worth it since it was indirectly addressed twice. NatraBurst claims to be a health product. Consumers are entitled to know how healthy the product is. Would you buy a multivitamin without knowing the quantity of vitamins in it? Of course not. The One24 podcast becomes a little wordy so I’ll just quote the summary of this point at 25:50 point of the Podcast. This makes a mockery of the One24 consumer. There is no advantage for a potential One24 consumer to have this information hidden from them. This is critical information for any “health” product and is necessary to make an informed buying decision about the product. If the company doesn’t want to disclose any more than what’s on its nutritional label, consumers are better off buying Carnation Instant Breakfast for a fraction of the money. Carnation Instant Breakfast does disclose its information. Where do I begin here? It seems that “there are few viable manufacturers out there.” How are we supposed to trust that One24 has chosen the viable ones? Is it because they were so straight-forward about the Slender Now story… ignoring the fact that it failed? Is it because they completely ignored the math that such schemes can’t succeed… and that the very CPA who questioned their story was proven to be right? Is it because the question was dodged about the product being available on auction sites for 50% below retail? Is it because this entire podcast focuses on every point that I brought up… except for the most important one about the FTC guidelines of MLMs and pyramid schemes? It turns out that Joe Perry’s reason for lack of willingness to not give tours of the manufacturing facility is a smokescreen. One24 could enter in an exclusive agreement with that facility which would prevent competitors from getting that advantage. It’s business 101 – clearly someone with 30 years of industry experience should know about. Mr. Perry mentions that “when we go to our next level of manufacturing we may be set up to do that.” This is a little vague… what changes then? You are going to get a better manufacturer that you can have tours at? Perhaps you are going to get the exclusive relationship at your own manufacturer as I suggested before. If so, at least come clean and say that you are working on it rather than being vague about it. Finally, if there are many manufacturing facilities that are not reputable out there (from Mr. Perry’s comments), and One24 is not willing to disclose their factory… well as a consumer, why have trust in it? It’s interesting that now Mr. Perry refers to it as a “commission program” and not a “compensation plan” or “comp plan” as Phillip Georgeson referred to it. A “Commission program” is for those salesmen who make retail sales, not recruiting others. From there he goes into a franchise argument, specifically mentioning Kentucky Fried Chicken. He says that Harland Sanders wouldn’t have probably been a famous and wealthy man if he only had one chicken store. Mr. Perry makes the point that he uses the process of duplication. The key point here is that KFC is not an MLM. That concept is outside the scope of this article, but it’s not hard to prove that if KFCs didn’t sell product and made most of their money recruiting other KFCs, it would collapse as well. Imagine if KFC made most of its money by recruiting other KFCs… you’d get to that over-saturated point fairly quickly. It’s worth mentioning that all MLMs have a component of Amazon’s affiliate or referral program to them. It simply means that if I refer a product to you and you buy it, I get a commission. Mary Kay and Amway have done this for decades. In fact the FTC says that this is the way sustainable, non-pyramid, non-illegal MLMs, should work… here are the FTC’s guidelines once again. Note the focus on retail sales. So when Mr. Perry claims that One24 has features of an affiliate program and features of an MLM, he really could have said that it has features of an MLM, since they are all “hybrids” in the sense of having the affiliate side of the business. “If someone were to go into this 3, 4, 6, 10 years out they would have the level of potential success as the person who started from the beginning. Is that a fair assessment? “Oh yeah, and I think any fair plan… you know a pyramid is something that pays people at the top that started first. And when you look at One24… I watch the numbers each month… I’ve looked at new people that are coming in that came in 6 months after … and 6 months sounds probably pretty small, but we’re less than a year old. I look at some the most recent PCs that are doing extremely well and they are going to be passing the guys that got in 6 months prior to them if they keep doing what they are doing pretty quickly if they keep doing what they are doing…. that’s an excellent point. Mr. Perry makes a great point that they are less than a year old. How can they speak to whether someone would have the same success 3-10 years? Note that they never said you’d have the same odds of success, just a “level of potential success.” From the Slender Now experience we know that similar companies tend to dry up pretty quickly. Also note that Mr. Perry says “some of the most recent PCs.” There is a wide chasm between possible and probable and the company isn’t willing to give any numbers or statistics on it. I’m having a flashback to that woman who wanted to by a new stove with Slender Now. I’m betting she was excited and thankful until it collapsed. People exhibit the same emotions when they join a pyramid scheme and get their first taste of the money rolling in. At 22:30 Philip Georgeson tries to sum up the “interview” with points to for the PCs (distributors) to jot down. He makes a point that is not “a recruiting-driven tool based on the financial aspects and retirement aspect…” The response to this charge about the company being “a recruiting-driven tool” was that One24 was derived “by doing one thing… that one green ticket, referring one person to become an auto-ship ofa product NatraBurst and repeating that.” His point continued “When you do that over time, repeat that over and over, great things happen.” Sounds like One24 agrees with me that NatraBurst is a recruiting-driven tool and that these “great things” are the potential financial rewards from such recruiting. We said the same thing, just used different choices of words. The Podcast didn’t even try to make a distinction. Next up is a recap of the section that I talked about in One24 as a Pyramid Scheme area. My favorite part is that he admits that One24’s policy of recruiting 24 people would blow through the world’s population “is probably true on paper.” However, he tries to make the distinction that “It can’t happen”, based solely on the evidence that it is has never happened. He neglects to mention that it’s because enough people are too smart to fall for such scams and PCs (distributors) drop out when they find that recruiting people isn’t a sustainable business. Philip Georgeson then tries to slander me for bringing such a logical argument that he agreed is “probably true.” He says that to compare One24 to a pyramid scheme, “I think speaks to the level, or lack there of, of education and intellect of what they know in the industry itself.” It short he’s attacking my intelligence for applying The FTC guidelines about the MLM industry to One24. Nowhere in the Podcast do they address the FTC or their stance. He says that the product, NatraBurst, was developed well before One24 was established. The timing of when the product was created is irrelevant in such schemes. The product could be gallons of milk for all it matters. What One24 is really pitching here is the business. Otherwise they wouldn’t have stress the “great things” that can happen from recruiting others into the scheme. This is what makes the product an afterthought. You could plug in just about any kind of consumable. Philip Georgeson says that One24 had this product, a “superfood”, already prepared and then the concept of One24 came in. I would need to see a lot of evidence backing this up, because these are people who, in their own admission “spent more than 30 years in the MLM industry.” People in MLM industry always seem to stumble upon these “super-products”, which just happen to be perfect for their scam. I covered NatraBurst Nutritional Information as Proprietary Information fairly well. The point is that NatraBurst is health product and, as such, should disclose all information necessary to the consumer to determine if it is healthy. For good measure, Philip Georgeson takes something that I didn’t say and suggests that I lack knowledge. He goes on, “So you [PCs/distributors] get to turn that table and spin that because whoever puts that out there is not understanding the categorization of what NatraBurst really is.” You have to love with a company tells its sales force to “spin” things, especially when consumers try to get necessary information to make an informed purchase. Philip Georgeson, then recaps and says that it One24 an MLM. However, a number of times, they’d talked about being the direct marketing (MLM) industry. Mr. Georgeson tries to spin it into being a hybrid between an affiliate program and “of course the successful tiered element of Multi-level Marketing (MLM), which gives you the wealth, which gives you the foundation and the only ability to capitalize on the efforts of others.” It’s interesting that they tie the MLM opportunity to the wealth proposition here, but previously they said that One24 should not be categorized for its financial and retirement aspects. This company can’t seem to make up its mind. This is what happens when the FTC says you can’t make these of claims and you need these kinds of claims to keep the sales force motivated in expanding the scheme. As for the One24 not being a MLM, it seems like their plan is to take the MLM and try to dress it up as something different. It’s putting lipstick on a pig and calling it Scarlett Johanson. That’s pretty much the end. After more than 6500 words, it’s about time, right? Stop me if you’ve read this one before. I write about a multi-level marketing (MLM) scheme and their lawyers send me an email that I’m going to be in trouble. This happened with MonaVie twice. Yesterday, a lawyer claiming to represent One24 contacted me about my article: One24 Scam. In it, I explained that the FTC has said that some multi-level marketing are actually pyramid schemes. I then showed how the FTC’s guidelines for pyramid schemes apply to One24. When in doubt, one of the first places I go to is the Electronic Frontier Foundation’s Blogger’s Guide. The EFF is one of the best known and reputable sites I know. They even have a whole FAQ devoted to defamation, which comes in handy in times like these. One of the first things the guide makes clear is that defamation is against a person. At the bottom of the page you get to a question about trade libel, which as it says, “Trade libel is defamation against the goods or services of a company or business. For example, saying that you found a severed finger in you’re a particular company’s chili (if it isn’t true).” So one of the first things to note is that One24 wouldn’t have a defamation case, they’d have a potential trade libel case (if any case at all). The most important thing that I see here is that there has to be “a false state of fact.” So if I were to say that One24 is a pyramid scheme, One24 would need to prove that is not a pyramid scheme. This would be an extraordinary difficult thing to do considering the FTC’s statements as I showed in my original One24 post. In this regard, not only would One24 have to prove that it isn’t an illegal pyramid scheme. It would have to prove that it wasn’t reasonable for me to suggest it was a pyramid scheme which would be extremely difficult considering this article from the FTC about MLMs and pyramid schemes. The rest of the email is interesting. I should point out that the email has a few typos and grammatical errors. I wouldn’t typically point this out, because as a blogger, my posts are filled with them. However, as an official communication from a lawyer, this seems very unusual. It also makes the common error that all pyramid schemes are investigated promptly. Bernie Madoff was operating his for more than a dozen years. There’s even a book about it. It is also worth noting that in many cases, there is no one to bring these cases to trial. The one organization that could do it, is the FTC. However, the FTC doesn’t have the budget to fight against one company, FreeCreditReport.com – it’s hard to imagine it could bring cases against every MLM company that it felt was a pyramid scheme. Furthermore, Pyramid Scheme Alert has an article about politics and why the FTC lets MLM run wild in America. I’m not a political scholar so I’ll leave that as an exercise for the reader. Is One24 just trying to Whitewash Justified Criticism? The final part of the email essentially demanding that I take down “negative comments” looks to me like they are trying to squash criticism. It’s important to note that the email didn’t state that I should remove “false negative comments”, but all negative comments. I’m pretty sure that I’m legally allowed to criticize a company. I returned an email to them that I don’t believe there is any defamation case to be had here. I then strongly suggested that they consider the consequences of bringing legal action against me. There is a well-known phenomenon called the Streisand effect. Wikipedia describes it as, “primarily online phenomenon in which an attempt to hide or remove a piece of information has the unintended consequence of publicizing the information more widely.” If One24 is looking to keep the negative comments quiet, the approach they are taking has a history of backfiring. What are you thoughts? Let me know in the comments.